IDEAL LOCATION... 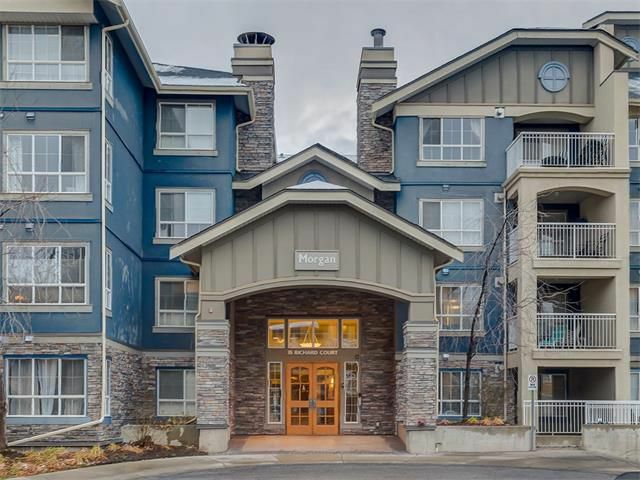 This CHARMING condo is just steps away from MOUNT ROYAL UNIVERSITY, shopping & the upcoming CURRIE BARRACKS area. With only a 5-7 minute commute to DOWNTOWN, GLENMORE RESERVOIR& WESTHILLS MALL. Situated in the " MORGAN ON THE PARK" complex which features everything you need! Exercise room, party room, media room & GUEST SUITES! This BEAUTIFUL one bedroom condo showcases stunning upgrades including INCREDIBLE flooring, CHIC lighting, MOCHA CABINETRY & Modern paint colors. Corner gas FIREPLACE creates cozy ambience, eating bar perfect for ENTERTAINING & a SPECTACULAR SOUTH FACING covered patio ideal for barbequing all year round. An ABUNDANCE of large SOUTH FACING WINDOWS create bright & sun filled rooms in this TRENDY, OPEN CONCEPT home. Other features include HEATED UNDERGOUND TITLED PARKING, assigned STORAGE, free car wash, VISTOR UNDERGROUND PARKING & bike storage. What a FANTASTIC OPPORTUNITY to own your own home or make a GREAT INVESTMENT! Book your showing today. Virtual tour above.